A few months ago, we looked at the economics of solar PV investments for businesses. This overview specifically explored the concept of behind-the-meter electricity generation which is empowered by Alberta’s microgeneration regulation. We have received a few questions about the regulation and thought we would provide an overview of the behind-the-meter/microgeneration concept on this week’s blog. However, if you own commercial property and/or land, you may have also thought about producing solar energy not for your own use, but to sell into the grid to turn a profit. This is called distribution-connected solar and it is now easier to do as a result of the recently approved small scale generation regulation. This will be a topic of a blog in future weeks. While solar PV panels can be installed on most rooftops and suitable land and require little upkeep or maintenance once deployed, it’s important to first determine what you plan to achieve with solar electricity generation. Today we’ll look at the scope and purpose of implementing a behind-the-meter solar PV project through Alberta’s micro-generation regulation. Behind-the-meter generation projects are governed by the Alberta Microgeneration Regulation, which stipulates a maximum system size of 5 MW. The purpose of these systems is for owners to generate and use electricity on-site, reducing the need to draw from the grid. This is commonly referred to as load-offsetting. Since behind-the-meter solar PV projects are typically connected to the grid, the Alberta Microgeneration Regulation contains a net-billing provision which recognizes that at certain times behind-the-meter solar PV installations may actually be producing more energy than can be consumed on site. This provision enables surplus solar PV energy to be exported into the grid through a bi-directional meter and in return, the system owner will receive credit on their bill that can be used against future consumption. During times where the solar PV installation is not producing enough electricity to meet all onsite consumption, electricity is drawn from the grid through the bi-directional meter to meet all consumption demand. For behind-the-meter solar PV projects, the microgeneration regulation essentially allows the project owner to utilize the grid as a storage mechanism, allowing electricity to be exported to the grid in times of excess production, and to be drawn from the grid during times of excess demand. It is important to also understand another key component of the microgeneration regulation, which categorizes behind-the-meter projects into two sizes: Small Microgeneration (systems up to 150 kW) and Large Microgeneration (between 150 kW and 5 MW). The credit received for exporting surplus electricity from Small Microgeneration installations is based off the project owner’s retail rate, while surpluses generated from Large Microgeneration systems is credited based on the hourly market rate. It is also important to understand that no matter whether your behind-the-meter project is a small or large microgeneration project, the electricity that is generated and used onsite is usually going to be more valuable then any electricity that is exported to the grid. This is because, as mentioned above, the electricity generated and used onsite allows the project owner to receive value from avoiding both the cost of the electricity and several variable charges on the utility bill. Conversely, the credit received for surplus electricity exported to the grid is for the price of the electricity only. Since you can only ever receive non-transferable credit for producing surplus in a behind-the-meter systems, it’s important that your solar PV system is sized to be no larger than to offset your annual consumption load onsite. There’s no economic benefit to overbuilding, and doing so is not in the spirit of the Alberta Microgeneration Regulation. Implementing a behind-the-meter solar PV project through the microgeneration regulation is straightforward. Application is made to the Distribution Franchise Owner - DFO (Wire Owner), where system details are provided. Upon approval of the DFO, the solar PV system is installed, and before being energized, the DFO is required to pay for and complete the installation of a bi-directional meter. 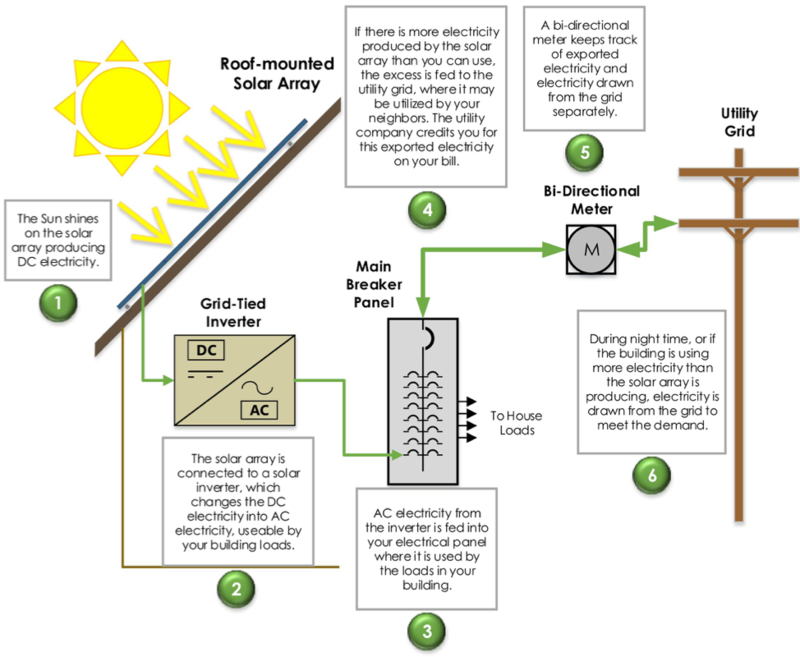 Of course, any solar PV system must meet all electrical codes and obtain required municipal permits before proceeding. Our solar PV team is able to deliver turn-key projects that take you from start to finish in implementing your behind-the-meter solar PV projects, from initial system design and determining the appropriate system size through to regulatory approval and installation. We can even support you with potential financing options. Contact us now to get started on your behind-the-meter solar PV project.